The IPCRESS File was written by Len Deighton and published in 1962. A huge commercial and critical success, it is often mentioned as one of the best spy novels of all time. It was also the basis for a successful movie starring Michael Caine as Harry Palmer. 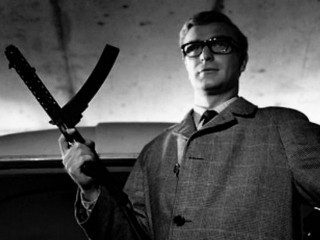 What does IPCRESS stand for? It’s 1961. An unnamed British agent (I will refer to him as ‘Harry’, the only name he gives in the novel, though he says it is false) is reassigned from Military Intelligence to a small civilian intelligence agency named WOOC(P), known as ‘Provisional’. The head of Provisional, Dalby, tells Harry that a British scientist has disappeared, the latest of eight top priority personnel who have vanished in the last six weeks. He suspects a man codenamed Jay is involved and sends Harry to offer money for the scientist’s return. Harry meets Jay and goes with him to a seedy nightclub, where he finds the missing scientist but a police raid interrupts him. Jay and the scientist disappear again. Harry travels to Beirut, followed by what he assumes are Jay’s operatives. Dalby learns that Jay is going to smuggle the missing scientist over the border into Syria in the boot of a car. Dalby and Harry set up an ambush and rescue the scientist, killing the operatives who were tailing them, who turn out to be from US Navy Intelligence. Back in London, the police pick up one of Jay’s gang, but he is killed before Harry can interrogate him. However, the arrest does lead Harry to a safe house, which he raids with the help of the police. Although it has been abandoned, they discover a tape with what sound like distorted human voices on it. Dalby takes Harry to observe an American nuclear weapons test in the Pacific. There, Harry discovers that the Americans have the same problem with their scientists disappearing, and that they suspect he is a Soviet agent. The IPCRESS File has a Mystery plot (see Spy Novel Plots). Discovers a disaster perpetrated by an unknown Antagonist for unknown reasons (or is assigned to investigate by their Mentor). Makes a plan to investigate the tragedy and discover who the Antagonist is. Investigates and gathers clues suggesting who the Antagonist is. Is impeded by the Antagonist. Involves one or more Allies in their investigation (Optionally, there is a romance sub-plot with one of the Allies). Attempts to discover further clues to the identity of the Antagonist, dealing with further Allies and Enemies as they meet them. Discovers the identity of the Antagonist and the reasons for their actions and any wider plan. Is involved in a final confrontation with the Antagonist and stops (or fails to stop) them carrying out their plan. The IPCRESS File is all about style. The prose is not at all the usual third-person narrated, straightforward style favoured by most espionage thriller writers. Instead there’s an almost stream-of-consciousness, sardonic commentary from the first person narrator as events unfold. Unfortunately, to a current-day reader many of the sarcastic references are now obscure. For example: “I was no Steve Reeves.” meaning the hero isn’t feeling well. Steve Reeves was a well-known bodybuilder and film star in the nineteen sixties. Using first person narrative enabled me to tell the story in the distorted way that subjective memory provides… what happens in The IPCRESS File is to be found somewhere in the uncertainty of contradiction. This is a risky technique, and so Len Deighton’s novels are not for everyone – what one reader finds enticing and mysterious another will find obtuse and confusing. Also, because of the restriction to Harry’s point of view, and his lack of understanding of what is actually going on, the ending is a bit of a let down, not just because the antagonist gives up without a fight, but also because it is effectively a deus ex machina. Like The Spy Who Came In From the Cold, The IPCRESS File was to an extent a reaction to the success of James Bond. The IPCRESS File reacts to the upper-class, ‘champagne and spying’ lifestyle portrayed in the Bond novels by showing a down-at-heel Britain, a cynical protagonist, and an espionage world as concerned with claiming expenses and navigating office politics as investigating enemy plots. MKULTRA is the closest known real project to IPCRESS. It was an illegal CIA programme to develop drugs and torture techniques for use in interrogation and mind control. Trials included forcing people to take LSD and other drugs and subjecting them to continuously looped audio messages, hypnosis, sensory deprivation, and other mental and physical abuses to ‘brainwash’ them in a similar manner to IPCRESS. A triumph of style, and written unlike any other spy-thriller. A classic. The IPCRESS File was filmed in 1965, starring Michael Caine as ‘Harry Palmer’ and directed by Sidney J. Furie. The movie of The IPCRESS File captures the essence of the novel despite only using elements of the plot. The sections of the novel in the Lebanon and on the American base are dropped, with the action set entirely in London. The movie plot focusses more on the brainwashing than the novel does, and the dénouement is completely different. Michael Caine makes the film with a great performance as the sarcastic, cynical, bespectacled Harry Palmer, in only his second big role. The IPCRESS File novel is available on Amazon US here and Amazon UK here . The IPCRESS File movie is available on Amazon US here and Amazon UK here . If you’d like to discuss anything in my The IPCRESS File review, please email me. Otherwise, please feel free to share it using the buttons below.